Richard Swift shows one of his woodworking projects. The 91-year-old took up serious woodworking as a retirement hobby. 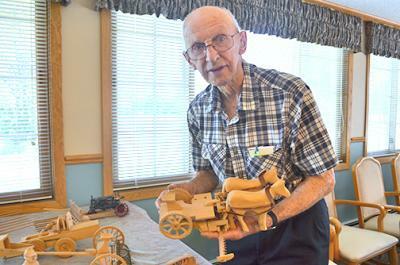 From the train that passed his house each day as a child to the wagon and tractors he drove as an adult on his own farm, the equipment of Richard Swift’s memory has come back to life in his woodworking creations. Each piece is based on something he’s seen, used or experienced, a story tied to each one. All 30-plus pieces of Swift’s collection are currently on display at Orchard Estates where Swift, 91, lives. The collection is a compilation of 25 years worth of woodworking. The adventure began in the early ’80s when Swift retired from his farm. Swift said he’d always had the ideas in his head, but never actually had the time to implement them. The work gave him a purpose after retirement, when he felt he wasn’t doing anything productive. “I thought ‘Hmm, what’ll I do? I can start making things that I can remember,’” he said. His first piece was the steam shovel he used when he was 12 years old. “It’s all made from what I thought I could remember,” he said. The rest of the pieces come from similar experiences in his past. Swift recalls the history behind them as he demonstrates how each model works and moves, telling stories of mail cars, traveling salesmen and hard farm labor. Each wooden model is extremely intricate, with all the small and necessary pieces that the original would possess. “You have a picture in your mind of what you want to express,” he said.